Among the myriad measures to enable trade, reforming border administration deserves special attention. It requires little money and can be done relatively quickly. OECD estimates that implementation of the Trade Facilitation Agreement (TFA) would require between $4 to $20 million by country, on average, with fairly low direct annual operating costs.17 UNCTAD’s cost analysis echoes the OECD’s, and finds that three quarters (28 out of 37) of TFA measures would require, on average, three years or less for implementation, with the remaining measures needing five years or less.18 Furthermore, reforms in this area are mostly uncontroversial and therefore require only limited political capital, as confirmed by the adoption of the Trade Facilitation Agreement in 2014 amid a very difficult international context. Moreover, proposed TFA reforms can support government revenue collection and provide a boost for business. Significantly, they can mostly be done unilaterally, although some aspects require international cooperation (e.g. in matter of transit). Finally, adoption of the TFA, and its upcoming entry into force—most likely in 2017—provides not only momentum for reforms, but also resources to developing countries to help them implement the Agreement (see Chapter 1). Yet, reforming border administration is not an easy task and therefore requires strong political and bureaucratic will; close cooperation among a myriad agencies, bodies and actors; and, sometimes, direct assistance. From a practical standpoint, improving border administration consists to a large extent of improving policies and regulations, although it also requires adopting or upgrading IT infrastructure, building capacity, and additional investment. The success of TFA implementation will be measured in terms of the existence of adequate regulation on matters such as information availability, formalities, advance rulings, appeal procedures, fees and charges. Currently, the best information on the state of implementation of the TFA is compiled by the OECD, using proprietary data and other sources, including the Global Expression Association. However, the OECD indicators provide little information about the actual enforcement of the regulations, let alone their effectiveness, which is what ultimately matters. This distinction between the de jure and the de facto is still difficult to establish, precisely due to the lack of indicators about the latter. 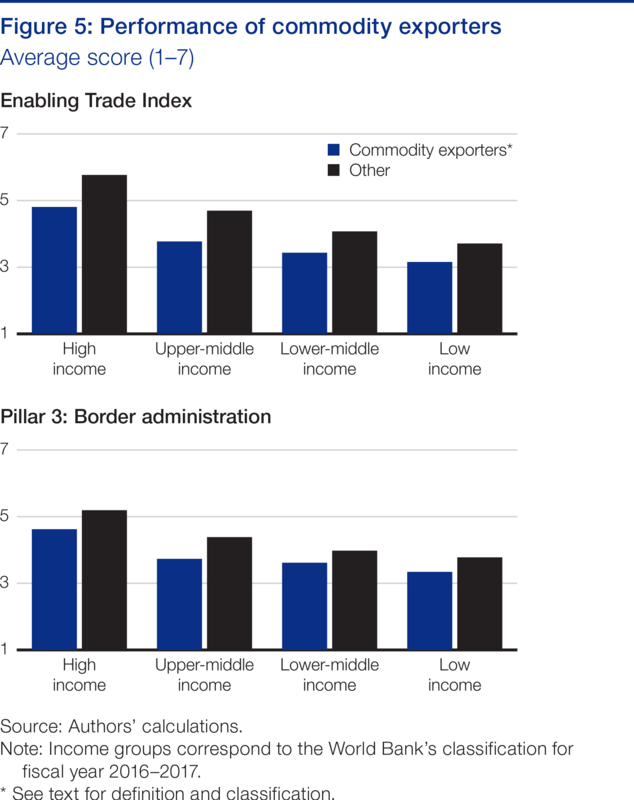 This is the gap that the Global Alliance for Trade Facilitation’s work on data aims to fill. Already the results of the World Economic Forum’s Executive Opinion Survey (EOS) suggest that good regulation does not imply good performance. 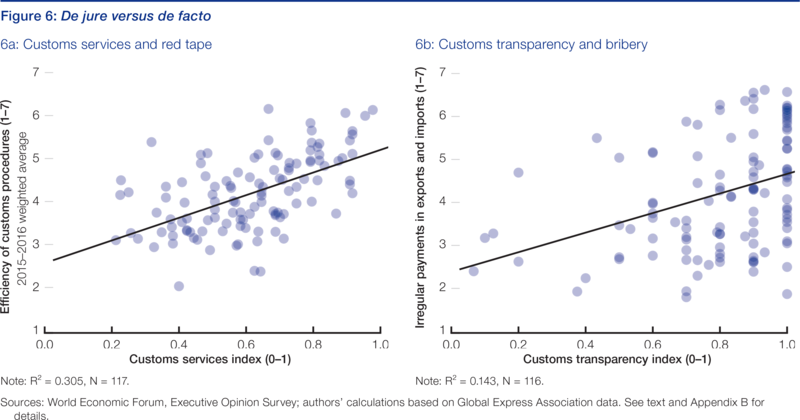 Figure 6 shows the positive, but very loose relationship between the level of customs services and the perceived efficiency of customs (6a), and slightly closer relationship between customs transparency and perceived bribery in customs (6b).21 In fact, many countries achieve the maximum score of 1 for regulatory transparency, including Nigeria, which has earned the worst score–1.9 on a 1-to-7-scale–on the bribery indicator (derived from the EOS) among the 136 economies included in the ETI. It is difficult to establish whether this disconnect is due to a lack of enforcement of transparency rules, the lack of anti-graft rules, or both, but it is a cautionary tale. 19 For the purpose of this analysis, a country where fuel and mining products account for more than 50 percent of its export is considered as commodity exporter. Authors’ calculations based on World Trade Organization’s Trade Statistics database (accessed 16 November 2016). High-income: Australia, Brunei Darussalam, Chile, Kuwait, Norway, Oman, Qatar, Saudi Arabia and Trinidad and Tobago; upper-middle income: Algeria, Azerbaijan, Colombia, Gabon, Jamaica, Kazakhstan, Russian Federation and Venezuela. 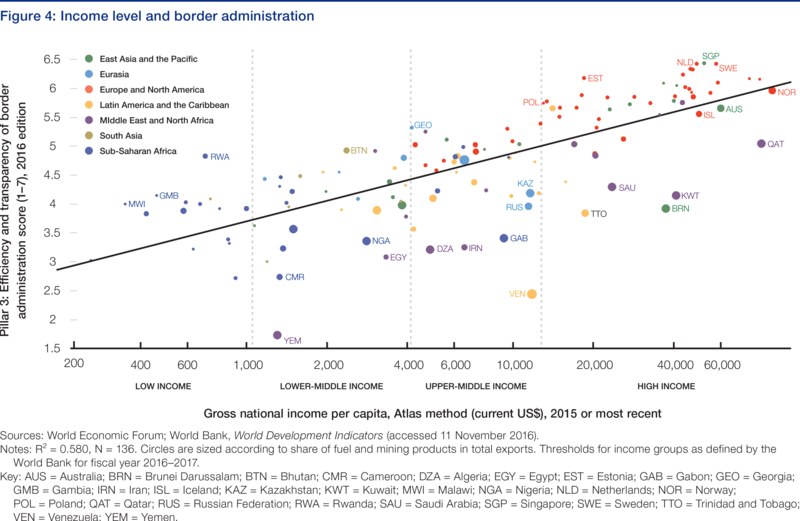 Lower-middle income: Bolivia, Lao PDR, Mongolia, Nigeria, Tajikistan, Yemen and Zambia; low-income: Chad; Democratic Republic of Congo, Liberia and Mozambique. 20 Dennis and Shepherd (2011) find that a ten-percent reduction in the costs of international transport and domestic exporting costs is associated with export diversification gains of 4 and 3 per cent, respectively. The authors find that customs costs play a particularly important role in these results. 21 The EOS indicator on customs efficiency is not part of the Enabling Trade Index. The question and associated answer reads as follows: “In your country, how efficient are customs procedures (related to the entry and exit of merchandise)? [1 = Extremely inefficient; 7 = Extremely efficient].” See Browne et al. 2016 for more information.